For smaller groups who still need reliable transportation without the price of a full-sized charter bus, the 18-passenger minibus is the perfect vehicle option. 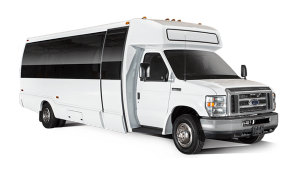 As the most compact bus rental available, this minibus serves as the ideal option for shuttle services for weddings, corporate events, private affairs, and other outings around town. Champion Charter Bus is your go-to resource for group transportation solutions across the western United States. With experience servicing sports teams, school trips, senior groups, and other types of trips, we can simplify your bus reservation process. We’re ready to help 24/7 at 1-844-693-9330.